One Last Wish Of A Dying Father To His Daughter Comes True…Gracious!! Suffering from level four lung cancer, John Sheldahl was told three years ago, by doctors that he was left with about eight months in his life. As if sickness was not an issue, he had in mind to accomplish one last wish. It was exactly on a Monday, when he saw his daughter down the aisle in an unplanned wedding ceremony which took place in the roof tops of the hospital. The nurses working at Mary Greeley Medical Center in Ames; a society north of Des Moines, ensured the wedding was a successbecause John was not in a position to leave the hospital. They abought the cake and decorated the place. It was a really fast wedding, organized within three days as Aubrey Reser, the nurse put it. 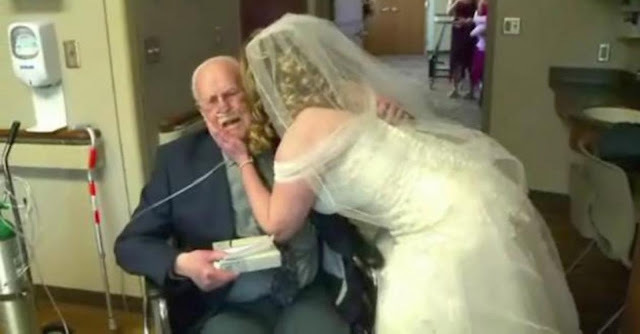 Nobody expected to see him accompany his daughter, Sheila, down the aisle and handing her over her future husband to be. Many were seen shedding their tears because Sheldahl was on the wheelchair unable to stand due to the weakening chemotherapy. Although tears rolled down the cheeks on everyone present, Dennis Atkinson, the groom gave a word of encouragement saying that it was the Almighty who had made all possible. Without doubt, you will shed tears when you take a look at this special occasion. Let your family and friends be inspired by the video’s message by SHARING with them on Facebook!